CD engineered by Gord Nicholl and John Armstrong of legendary punk bands Pointed Sticks, and The Modernettes. Stories Without Words, Black Smoke Rising, I Don't Believe In You, Down To The Wire and Let Me Out were originally recorded and engineered by Malaika Killingsworth. Impressionistic, soulful, with vivid metaphors, Kevin House's songs are intimate, ornate; burnished with beautiful melodies that stay with you. Gutter Pastoral, his debut album, is a dinner party where lyrical poetry, and hushed mournful music are the main course. Spooky little fairy tales are what engineer Gord Nichol said while in the process of recording the album - featuring guest musicians Samantha Parton (The Be Good Tanyas), trumpet player JP Carter (Millenium Project), upright bass player Russell Sholberg (Tony Wilson Quintet), saw player Enzo Garcia (Jolie Holland), and pianist Mike Derrick (ex-Radiogram). At times bringing to mind a more weatherbeaten Nick Drake, there's something of the European chanson tradition at work here also; with a jazz influence creeping in here and there plus unusual guitar voicings, and strange ambient nuances. Born in England, Kevin immigrated to Canada in the early 1970s on the Queen Mary ocean liner. Growing up partly in the prairies and on the road with his parents; traveling and living in California and Arizona certainly influenced his later interests in Carnivals, sideshows, oddball history and storytelling. Living on the west coast of Canada, Kevin detoured to Manhattan for 2 years in 1999 playing clubs on the lower east side; making the New York pilgrimage as other writers before him for the inspiration that comes from such a diverse and energized city. Coming back from NYC as a painter as well as a songwriter, Kevin now splits his duties between painting circus sideshow banners and writing and performing songs. 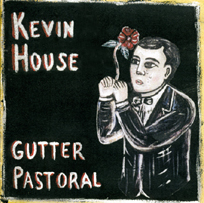 Written primarily on acoustic guitar and the Fun Machine (an antique home organ from the 1960s), Kevin's "spooky fairytale songs" can now be heard on his debut album, Gutter Pastoral. "Kevin House was a struggling songwriter who was obsessed with carnivals. Then a fateful brush with a circus freak turned him into one of the world's hottest folk artists...who is much in demand of late for his very particular variety of portrait. Not just of dogs and kids, either, but of writers, poets, sideshow characters and assorted human oddities, all in the style of old carnival banners."